The Colts would double up the Browns on the scoreboard in the first half. 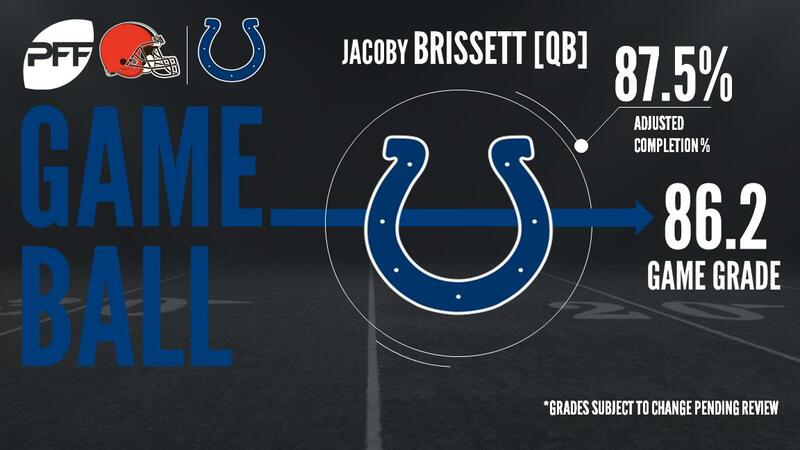 QB Jacoby Brissett had a pair of rushing touchdowns and a touchdown pass to WR T.Y. Hilton, and later RB Frank Gore would add a fourth touchdown. The Browns would respond late in the half with a QB DeShone Kizer touchdown pass to TE David Njoku, but the Browns would go into half time down 28-14. The Browns would be game for the second half however, as Kizer would throw a touchdown to WR Kenny Britt and would also run for a score. However they would fall short 31-28. With that, we give you our PFF exclusive takeaways from the contest for each team. Hilton wreaked havoc among the Browns secondary, hauling in 7 of 9 passes for a total of 153 yards and a touchdown, Brissett had a 155.8 passer rating when targeting his star receiver. He was especially effective when matched up opposite Jamar Taylor, where he caught 4 of 5 targets for 125 yards and a touchdown, with the one incompletion being a drop. Hilton averaged 5.28 yards per route run against Cleveland after he averaged just 1.61 yards per route run in the first two weeks. You’d think with a stat line of thrown at nine times, with just three receptions allowed to go against two interceptions and two pass break ups, Melvin would have a career grade. Well this is the case in point for how stats can be misleading. On both his picks he was the beneficiary of being beaten in coverage but having errant throws land in his arms, while the Browns struggles holding onto the ball helped as well. But it was a good performance from Melvin, who has quietly started the season very nicely, doing nothing to suggest he shouldn’t be starting. Sheard returned to the team that drafted him and played like he had a point to prove. Chiefly working on T Shon Coleman, he had his best day as a Colt with four pressures and a number of wins that resulted in near pressures. It’s taken time but he’s starting to show the ceiling he has, though he’ll need to do it against better tackles than Coleman to make fans believers in Indy. It was another quiet day for Joe Thomas, as he went about his job with the kind of near flawless performance we’ve come to expect. He built on his snap streak, didn’t surrender a single pressure and just for good measure was the highest graded Browns run blocker and their highest-graded player. Would you expect anything else? A redemption game for Kirksey, as he followed up the putrid 24.1 overall game he earned last week against Baltimore with his best game of the season in Week 3. The linebacker from Iowa tallied six total stops on the day – more than doubling his season total, he had five in the first two weeks – and played well in both run defense and coverage. Shelton ate up the middle of the field on Sunday, earning an 88.7 run-defense grade from his spot in the defensive interior. Shelton tallied five run stops on 19 run defense snaps; he had just one run stop on 32 run defense snaps in the first two weeks. Shelton had the second-most run stops among all defensive tackles last season, look for more weeks like this one moving forward.